Jurors in the murder trial of the man accused of killing a D.C. businessman — along with his wife, son and housekeeper — heard key testimony from the businessman's assistant, who prosecutors say unknowingly dropped off $40,000 in ransom at the time the family was being held hostage inside their home. WASHINGTON — Jurors in the murder trial of the man accused of killing a D.C. businessman — along with his wife, son and housekeeper — heard key testimony from the businessman’s assistant, who prosecutors say unknowingly dropped off $40,000 in ransom at the time the family was being held hostage inside their home. Jordan Wallace, 31, told jurors nothing seemed out of the ordinary when he communicated with his boss, 46-year-old Savvas Savopoulos, about delivering a package to the family’s Northwest D.C. home on May 13 and again on May 14 when Wallace left the bundle of cash inside a car in the Savopoulos garage. Testifying Monday, Wallace told jurors he didn’t know and had never met 37-year-old Daron Wint, the man who’s charged with first-degree murder in the killings of Savvas Savopoulos; his wife, Amy; 10-year-old son, Philip; and Vera Figueroa, one of the family’s housekeepers. 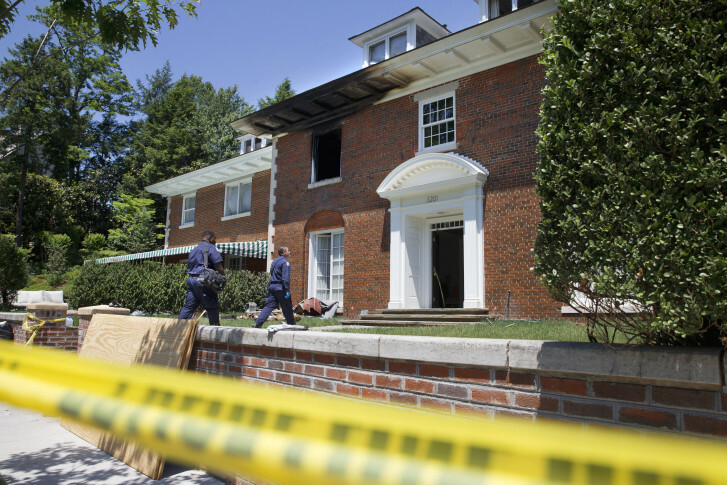 Prosecutors say Wint, a former employee of Savopoulos’ ironworks company, took the family hostage for the ransom money and then killed them and set the house on fire. But the defense — which claims it was actually Wint’s younger brothers who carried out the brutal killings — sought to poke holes in Wallace’s testimony, saying he lied to investigators when he was first questioned by police and texted a picture of the bundle of cash to his girlfriend and later deleted it. During questioning by both the prosecutors and defense attorneys, Wallace provided a timeline of events between May 13 and May 14 — backed up in many cases by records of text messages, voicemails and fast-food receipts. Wallace met the Savopoulos family when he was working as a go-cart racing coach at the Autobahn facility in Jessup, Maryland, and gave a few lessons to Philip. Wallace was hired by Savvas Savopoulos in March 2015 to run errands, drive members of the family to appointments and carry out other odd jobs, such as running an eBay account. Wallace said he was working alongside Savvas Savopoulos at the businessman’s soon-to-open karate studio in Chantilly, Virginia, on May 13 and left for the day about 5 p.m. He was supposed to report the next day at the karate studio to get it ready for the grand opening a few days later. At some point on the evening of May 13, however, Wallace said he got a voicemail from his boss, telling him there had been a change of plans and that he needed him to report to the American Iron Works office in Hyattsville, Maryland, the next morning to pick up a package. In the voicemail, which was played in court, Savopoulos sounded friendly and upbeat and even seemed to make a joke about Wallace’s outdated voicemail greeting. Despite the friendly tone, prosecutors say the call was placed during the time when the family had been taken hostage by Wint. When the voicemail was played, Wallace broke down on the stand and began crying. Wallace said he then got a call from Savvas Savopoulos about 7 a.m. the following morning about delivering the package. Wallace said he left that morning with American Iron Works’ chief financial officer, Ted Chase, to head to the bank. At the bank, Chase handed him the bundles of cash — $40,000 in all — and told him, “Guard this with your life,” Wallace said. Wallace told prosecutors his reaction was “Holy crap … never in my life” had he seen that much money. At 10:15 a.m. on May 14, Wallace received a text from Savopoulos telling him to put the package of money in the driver’s seat of a sports car that was parked in the family’s garage. He had told Wallace not to knock because he was on an important conference call. Wallace put the cash in the car then sent a text to Savopoulos at 10:26 a.m., saying “pkg delivered,” he said. After dropping off the cash, Wallace headed to the karate studio, he said. The rest of his day is accounted for thanks to fast-food receipts and store surveillance video — a stop at a Jimmy John’s in Chantilly shortly after 11 a.m.; a visit to a Lowe’s at about noon. At 1:40 p.m., he said he got a call from another American Iron Works employee about a fire at the Savopoulos house. Call and message logs shown in court depict what appears to be a frantic series of calls and messages to both Savvas and Amy Savopoulos. “Hey Ms. Amy, are you OK. If so you need to get home. I got a call your house is on fire,” Wallace texted at 1:44 p.m. He raced to the Savopoulos house, parked down the street and approached Fire Department personnel, yelling “that’s my boss’s house,” he told jurors. That same day, Wallace gave a statement to police, handed over his phone and password and agreed to provide a DNA sample. But the defense pointed out inconsistencies and what appeared to be outright lies in his initial statements to police. For example, at first, Wallace told police the sports car in the Savopoulos where he dropped off the cash was locked and that he had to retrieve a key from a chest of drawers in the garage. According to video of the police interview played in the courtroom Monday, Wallace even acted out unlocking the car door when he was first interviewed by police. But now, Wallace says that’s not true and the sports car wasn’t locked. Also, the keys were usually kept in a dish inside the house, he said. Wallace also told police that Chase, the company chief financial officer, handed him the money in a manila envelope. In fact, Chase handed him the money directly from his pockets and Wallace then placed it inside a black backpack, he conceded Monday. Police were tipped off to the inconsistency when they discovered Wallace had taken a photo of the backpack stuffed with cash that he had texted to his girlfriend on the morning of May 14 — and then deleted. “My job is insane. Don’t show anyone,” Wallace texted his girlfriend, along with the photo of the cash, shortly before dropping it off at the Savopoulos house at 10 a.m. May 14. Wallace told jurors he deleted the photo and texts, because he was afraid his boss, Savvas Savopoulos, would see it and it would come across as disrespectful or a breach of trust. The defense also pressed Wallace on his social media activity overall, suggesting he frequently posted photos from inside some of the family’s expensive vehicles and flaunted other aspects of the Savopoulos family’s wealth.